Not to be confused with Stradivarius. Stratovarius is a Finnish power metal band that formed in 1983. Their material contains elements of symphonic metal, progressive metal and NWOBHM. 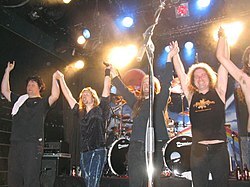 Wikimedia Commons has media related to Stratovarius. This page was last changed on 27 April 2018, at 09:38.